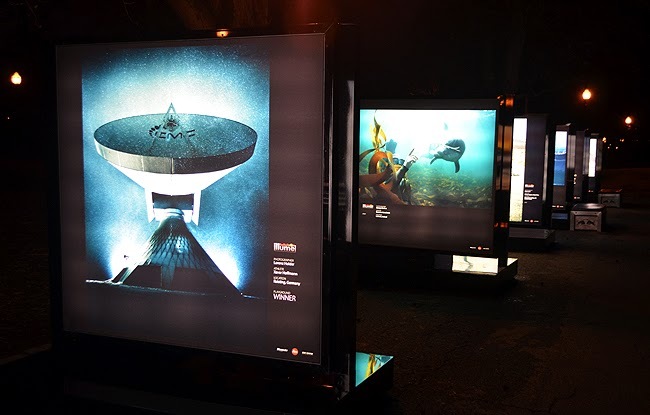 Atlanta is one of only two U.S. cities to show Red Bull Illume Image Quest 2013, held only every three years. 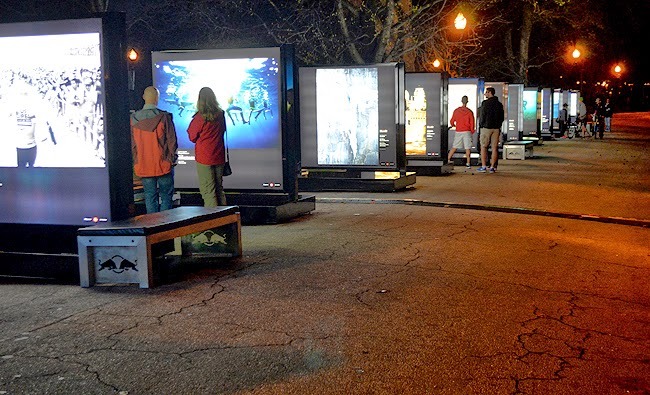 Exhibition host, Piedmont Park, positioned the exhibit at its 12th Street entrance. Open sunset to 11:00 p.m., you'll see it blocks before you get there...you can't miss it! 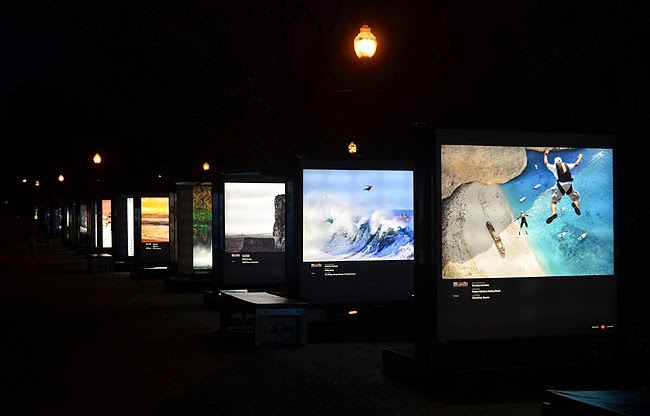 "Red Bull Illume is the world's premier international photography competition dedicated to the world of action and adventure sports. Its purpose is to showcase the most exciting and creative action sports photography on the planet as art and bring the public into the world of action sports." This is the third edition of the competition, one that I personally hope will continue, but given that it's every three years, we'll have to wait until 2016 for the next one. For the 2013 edition, tens of thousands of entries were submitted from photographers all over the globe. An impressive panel of international judges and photo editors narrowed those entries to the Top 50 images in 10 categories. The exhibition is on two separate paths, but close enough that you're not going to miss either. The majority of it is on the main path leading from the 12th Street entrance and the remainder is on the overlook facing Park Tavern and Monroe Drive. I was impressed by the visitors' friendliness, politeness, and how quite they were. I've visited many an indoor museum that was disrespectfully loud...no way to reflect or contemplate, so this was a refreshing experience. My evening at Illume was absolutely delightful. The exhibition has an information booth, as well as docents walking around answering questions, offering Red Bull—which I didn't take because I needed to sleep, and thought later I could have used it to wake up the next day!—and they were also giving a way a 6"x6" softcover books featuring the 50 photographs on display! That I graciously accepted. They asked which was my favorite and I had to think about it...there are some incredible works here! I said of course that I love the one with the Stormtrooper helmet (the distraction almost caused me to miss the athlete in the top right corner of that image), which was one of the girl's favorite, as well. But my final favorite image—one that made the To 10 finalists list—is a shot by photographer Lorenz Holder of a huge white building kn Sweden with high-contrasting horizontal rectangular windows. The sliver of ground showing is covered in pure white snow and the action in the shot is snowboarder Jordan Mendenhall jibbing the rail of a slightly snow-covered set of stairs. I love the shot! I was surprised to see a mobile bar with beverages and snacks, but how great that they had that available! 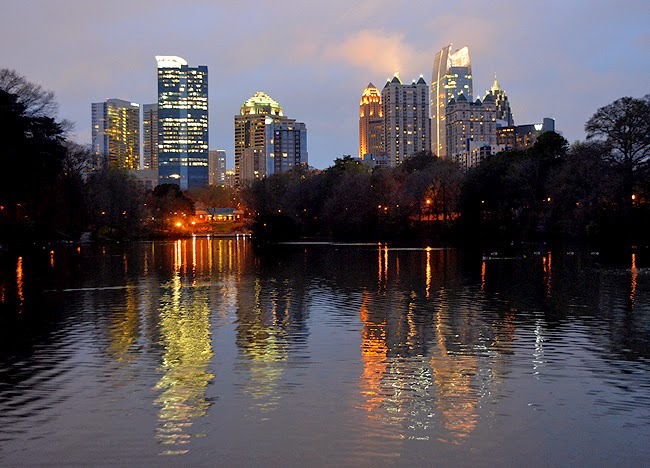 I have to say, from what I saw of Piedmont Park when I first moved here in 1987, I am incredibly impressed with what the Piedmont Park Conservancy has done to improve the Park. And they just keep going and going and going..."Thank you!" Piedmont Park Conservancy! I made this shot of Lake Clara Meer—a man-made lake for the 1895 Cotton States and International Exhibition—looking toward Atlanta's Midtown skyline, a mere few feet from the exhibition. So while you're there, pop over for a great view of our skyline! 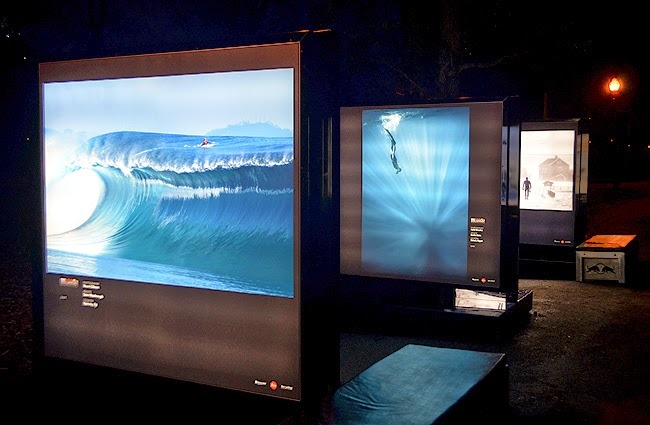 Remember, tonight and tomorrow night are the only remaining chances to see Red Bull Illume Image Quest 2013. The Awards Ceremony was held in Hong Kong and from there the exhibition went to Vancouver, Canada. Next stop and final stop: Scottsdale, Arizona.